In a new concept called traceless bond construction Mundal, Avetta Jr & Thomson form a new carbon-carbon bond in an organic reaction with the original functional groups completely disappearing (DOI). In terms of retrosynthetic analysis it means that there may exist more strategic avenues towards a desired molecule if only you look hard enough. In their case study a boc (tBuOCO) protected allyl hydrazone (RRC=N-NRR) takes part in an triflimide-catalysed sigmatropic reaction with subsequent loss of isobutylene, nitrogen gas and carbon dioxide. True enough, a forensic team would be clueless when presented with the raw reaction product because most of the accomplices have disappeared. Equally true, in many regular coupling reactions bond formation is also traceless and equally true as with coupling reactions the atom efficiency is just horrible. 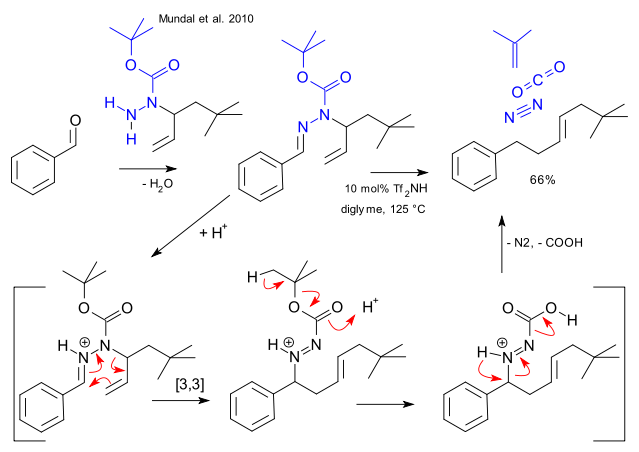 As an aside, the authors skillfully avoided an confrontation with the final part of the reaction mechanism, an acidic Wolff-Kishner reaction type removal of the dinitrogen group, This blog too gave up but if it is any consolation managed to steer away from anything carbanionic.